Pope Francis will be pleased to welcome President Recep Tayyip Erdoğan, the Catholic leader said Monday. The pope hosted ambassadors from 183 countries on the occasion of the new year at the Apostolic Palace, and also had a conversation with the Turkish ambassador, reports said. 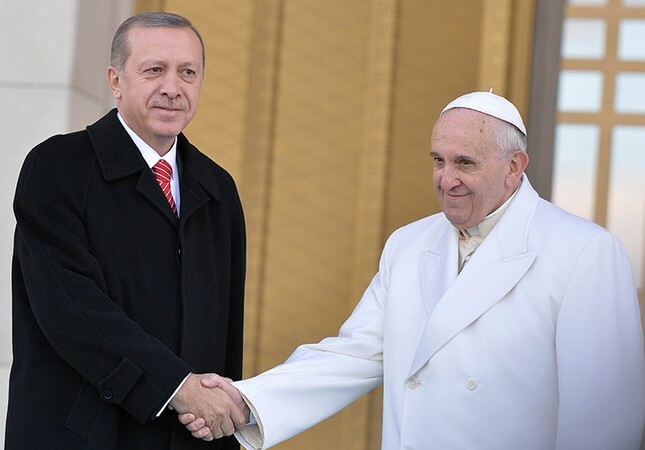 Ambassador Mehmet Paçacı told Doğan News Agency that he spoke with the pope, who told him that he expects President Erdoğan to visit him and will be pleased with the visit. "We are still working on the date, but it is not set yet," Paçacı said. In his speech, the pope reportedly urged international support for Turkey, Jordan and Lebanon for their efforts in hosting millions of refugees. President Erdoğan discussed the issue of Jerusalem with Pope Francis in a phone conversation held in December. Both sides welcomed the U.N. Resolution on Jerusalem's status and agreed to hold a meeting in the near future to discuss the issue of Jerusalem, bilateral relations and international developments.